Members of Resistance Pro wrestling at Albert Falcon's Warehouse Gym and Boxing Club in Highland Park, Illinois on Sunday, February 26, 2012. Resistance Pro wrestling consists of co-founders Gabriel and Jacques Baron, Creative Consutant Billy Corgan(of the Smashing Pumpkins) and features wrestlers such as and Bradley Jay (aka Lonseome Jay Bradley) and John Yurnet (aka "Mr. 450") who performed some practice moves in the ring. Jay Z once famously rapped, "I&apos;m not a businessman, I&apos;m a business, man." In truth he&apos;s both — as are these other musicians who have expanded their horizons beyond album sales, live shows and merch. Jay, Justin Timberlake and Sean Combs are renowned for their entrepreneurial spirits, and musicians like the Offspring&apos;s Dexter Holland, Marky Ramone and Maynard James Keenan have turned their culinary passions into successful side businesses. From clothing lines and energy drinks to restaurant chains and hot sauces, here are 15 business-savvy artists who aren&apos;t sitting around waiting for the royalty check to come. Jay runs a chain of 40/40 Club sports bars, is a Hollywood producer (see the upcoming Annie reboot), has owned a chunk of the Brooklyn Nets, established the billion-dollar clothing line Rocawear and joined clever partnerships with Samsung and Budweiser. But the real moneymaker for the NYC rapper: Expanding his entertainment company Roc Nation into the sports management world. Using Jay&apos;s influence to draw in high profile athletes, Roc Nation Sports was responsible for Robinson Cano inking a $240 million contract with the Seattle Mariners (much to the chagrin of Hova&apos;s beloved New York Yankees) and engineering Kevin Durant&apos;s new $300 million deal with Nike. Gwen Stefani fans aren&apos;t just looking forward to her turn as a judge on The Voice; they&apos;re also anxious to see the fall line from her L.A.M.B. clothing label. While some artists dabble in the world of fashion, Stefani&apos;s clothing line is an apparel powerhouse with distribution in hundreds of stores worldwide. For the past decade, L.A.M.B. – which takes its name from Stefani&apos;s debut solo album Love. Angel. Music. Baby. – has raked in double-digit millions for the No Doubt singer every year (Business Insider estimates earnings of $90 million a year.) L.A.M.B.&apos;s success has allowed Stefani to expand her fashion empire to include labels Harajuku Lovers, inspired by the notable Japanese fashion, and her newest brand Design With Purpose, a chic ready-to-wear line. The Red Rocker is the embodiment of the American Dream, if that dream is to spend a decade as the lead singer of Van Halen, relocate to Cabo San Lucas, Mexico, and then turn a boutique tequila brand into a $100 million paycheck. When Hagar sold an 80 percent stake in Cabo Wabo in 2007 for $80 million, it was the second-best-selling premium tequila in the United States. After serving as brand ambassador for another few years, Hagar sold the remainder of his Cabo Wabo shares in 2010 for another $15 million. The singer maintained his ownership of the Cabo Wabo Cantina restaurant chain as well as his Sammy&apos;s Beach Bar & Grill, which has six locations from Maui to New York. The King of the Parrotheads has turned a love of loafing on the beach and getting drunk on cocktails into a cottage industry. Buffett seems like an odd choice to get his own Hard Rock Café-esque themed restaurants, but the Margaritaville and Cheeseburger in Paradise restaurant chains are now in dozens of cities from Australia and Waikiki to Cincinnati and Biloxi. Having conquered the restaurant world, Buffett then transformed the Margaritaville brand into a line of casinos in places like Atlantic City, Bossier City and Las Vegas. In addition to that, Buffett also entered into a partnership with Anheuser-Busch to brew the singer&apos;s Land Shark Lager signature line. Early on in the history of Vitamin Water, 50 Cent agreed to endorse the product for a minority share in the company. Together, Curtis Jackson and Vitamin Water dropped the branded beverage Formula 50. Fast-forward a decade and a Coca-Cola acquisition and 50&apos;s minority share in Vitamin Water is reportedly worth $500 million. Not all of 50 Cent&apos;s investments hit the jackpot – his headphones partnership with SMS Audio hasn&apos;t caught on like Beats by Dre– but the rapper does have a successful film production company called Cheetah Vision that pumps out low-budget action movies for foreign markets, making 50 Cent hip-hop&apos;s Roger Corman. Just one look at the Kiss Shop reveals the merchandise empire Gene Simmons and Paul Stanley have erected. Kiss Mr. Potato Head Set. Childrens Starchild Kiss Costume. Kiss Catman Merry Kissmas Ornament. The infamous Kiss Kasket. Kiss managed to turn a little face paint into the best brand name in music. Just when you thought they&apos;d stamped their mark on everything, the Rock and Roll Hall of Famers found somewhere new to place their logo in 2014: On the helmets of the arena league football team the Los Angeles Kiss, which is co-owned by Stanley and Simmons. 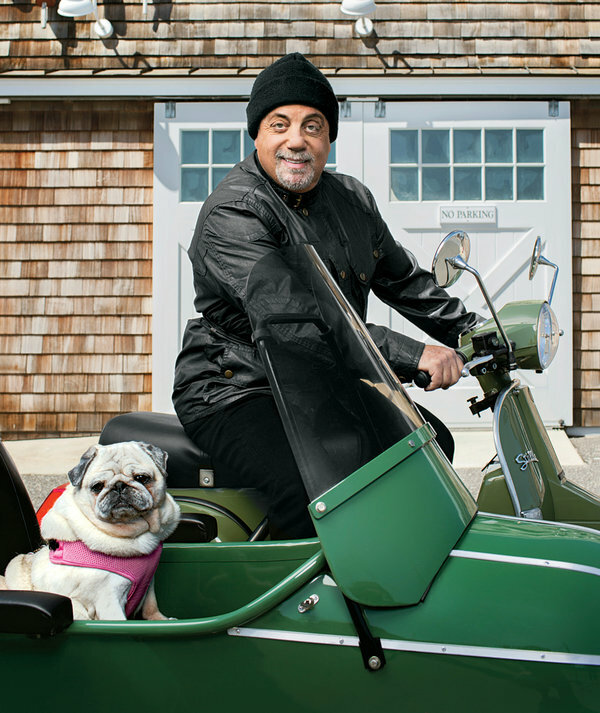 Billy Joel at his motorcycle shop, 20th Century Cycles, located in Oyster Bay, NY on November 26, 2013. The iconic singer is a 2013 Kennedy Center Honors award recipient, and has currently booked four shows at Madison Square Garden for 2014. The Piano Man&apos;s passion for choppers has been well documented ever since he bragged, "Even rode my motorcycle in the rain." There&apos;s also this amazing New York Times Magazine photo. Joel&apos;s 20th Century Cycles was born out of this love for motorcycles, and out of necessity: The singer&apos;s unique bike collection grew to more than 75 vehicles and he simply needed a venue to store and display what he assembled. So in 2010, Joel built himself a museum on his native Long Island. As the 20th Century Cycles site states, Joel&apos;s custom-built motorcycles aren&apos;t for sale – though you can buy swag like T-shirts! – so Joel isn&apos;t making a killing off this passion project. However, if he were to sell his collection, he&apos;d likely make enough money to rent out every luxury box at his monthly Madison Square Garden concerts. The Godfather of Grunge is more of an inventor than an entrepreneur, and his innovations are more of a response to his own world vision than an attempt to bulk up his bank account (like the LincVolt bioelectric car that Young has been working on for the better part of a decade). The rocker has long championed cleaner, more efficient modes of transportation – which explains his love of Lionel train sets – that didn&apos;t tether society to depleting, environment-damaging and war-starting natural resources. So Young and his team converted a 1959 Lincoln Continental into a plug-in hybrid, not to get a foothold in the burgeoning electric car market but just to prove that the technology works. Young the inventor has next set his sights and his ears on improving the way we experience music with his PONO music player, his response to the flat, unfeeling MP3 files that we listen to on a daily basis. You can&apos;t grow up in Southern California and not be obsessed with hot sauce. The fiery condiment is a way of life on the West Coast, and the Offspring&apos;s Dexter Holland turned that passion into a booming business. "I just thought it would be cool to have a hot sauce. I gave away the first batch as Christmas presents to my friends," Holland writes on the Gringo Bandito Hot Sauce site. "It has always been a DIY operation for sure. It started small but it has just kept on growing." The Smash singer earned a degree in molecular biology at USC, so he&apos;d have some extra insight into the interaction between ingredients. Over 1 million bottles of Gringo Bandito have sold in the past decade, meaning Holland&apos;s hot sauce has gone platinum. The ultimate multi-hyphenate, Timberlake is a singer, songwriter, actor, producer, record label exec (Tennman Records), clothier (William Rast), restaurateur (Southern Hospitality), golf course investor (Mirimichi), distiller (Sauza 901 tequila), and NBA team part owner (Memphis Grizzlies). And brand new to his résumé: Apple iPhone spokesperson. You could teach a semester-length Harvard Business School class on Diddy the Mogul, but his biggest ventures outside of music begin with his Sean John clothing line, which nets $250 million a year according to Business Insider. Diddy is also the face of Ciroc Vodka, a joint venture between the Bad Boy guru and beverage giant Diageo. And most recently, Combs got his Ted Turner on by spearheading Revolt, a television network developed in cooperation with Comcast that hopes to be the next MTV… or at least the next Fuse. If as being the frontman in Tool, Puscifier and A Perfect Circle wasn&apos;t enough work for Maynard James Keenan, in the early 2000s the singer embarked on another career: wine czar. After buying up plots outside of Sedona, Arizona, Keenan transformed the land into Cadeceus Cellars. (A possible reason Keenan chose Arizona: His Ænima era fears that California would descend into the ocean to form the Arizona Bay, which would result in his vineyard becoming a coastal town.) Keenan&apos;s wine empire has since expanded to include the Merkin Vineyards, which, in true Tool fashion, were named after the pubic wig. Keenan also turned his passion for grape-stomping into a 2010 documentary called Blood Into Wine. Cadeceus Cellars currently ships to 23 states and Washington D.C., so while you can&apos;t quite get Keenan to follow up 10,000 Days just yet, you can get him to send you a case of the good stuff. One taste of Marky Ramone&apos;s Brooklyn&apos;s Own Pasta Sauce on your spaghetti and it&apos;s clear the drummer knows seasoning like he knows rhythm. Marky Ramone became a marinara magnate in 2010, when he decided to share his recipe with the world. Marky even has a catchy slogan: "A recipe so flavorful, it beats the rest. Now put it to the test!" Ramone&apos;s pasta sauce is unique in that it&apos;s sold at record stores, concert venues, Jewish delis, Whole Foods and Italian markets… and that&apos;s just in New York. As an added bonus, 10 percent of all Marky Ramone&apos;s Pasta Sauce online sales benefit Autism Speaks. The Chronic rapper and G-funk extraordinaire can have his entrepreneurial instincts summed up in two words: "Beats" and "Billions." While the emergence of the iPod had everyone using identical white earbuds that crackled when confronted with Mobb Deep, Dre and his partner Jimmy Iovine sensed a desire in the marketplace for boutique headphones that looked good and were resilient to the bass. In 2006, Beats Electronics was born, and thanks to a well-curated stable of celebrity clients like Lady Gaga and LeBron James, Beats by Dre headphones became the industry standard almost overnight. Beats has since expanded into the world of music streaming and computer speakers, but it was Dre&apos;s headphones that inspired Apple to shell out $3.2 billion for Beats Electronics in May 2014. And just like that, Dre went from Death Row Records to a private jet heading for the Apple iPhone 6 party. In 2011, Billy Corgan created the Resistance Pro wrestling league and installed himself as a bald, Zero shirt-wearing Vince McMahon. Corgan has always made his love of wrestling known, even in his music; in 2008, the Smashing Pumpkins recorded a track called "G.L.O.W." that was Corgan&apos;s tribute to the Glorious Ladies of Wrestling. Amazingly, Corgan&apos;s wrestling league is so well received in his native Chicago that the Illinois State Crime Commission recently gave him an award for Resistance Pro&apos;s community outreach. For Corgan, the next step toward turning Resistance Pro into the WWE is securing a TV deal, which he has: AMC announced earlier this year that they were picking up eight hour-long episodes of what was billed as Untitled Billy Corgan Wrestling Project.